About midway through its enrollment period, Syringa Mountain School, the new state-funded charter school in Blaine County, already has about 90 students lined up to attend the school when it opens next fall. The school’s goal is to have 165 students in grades K-5, but it has the capacity for 190 students. Attendance at two public meetings the school has recently held confirms Wertich’s statements of public interest. The first was held on Nov. 21 in the Minnie Moore Room at the Community Campus and it was standing room only. The second, with an open-house format, was held Wednesday night at the Forest Service building in Hailey. “It was another full house,” Wertich said. A third meeting, also with an open-house format, is scheduled for 6-7:30 p.m. on Thursday, Jan. 9, at the YMCA in Ketchum. Longtime educator Mary Gervase, one of Syringa’s founders, has been hired as administrator, a position equivalent to principal. Gervase, with a Ph.D. in educational administration, has served as a K-8 school teacher, a principal, part-time director of The Mountain School, as an educational consultant to the Idaho State Department of Education and assistant superintendent for the Blaine County School District. The Mountain School is scheduled to close this coming spring. She said the school is also finalizing plans for a location, and is about to close on a parcel of land on Aspen Drive in the China Gardens area of west Hailey. “We will be building a school there,” Wertich said, adding that hopefully a new building can be ready for occupancy next fall. If not, she said, an alternative plan is to set up temporary modular units. Syringa Mountain School was approved as a charter school in August by the Idaho State Charter School Commission. As a charter school, Syringa will receive state funding on a per-student basis. Charter schools also rely heavily on donations because they are not allowed to levy for property tax funds. Wertich said some of the children thus far enrolled are currently students at The Mountain School. She said the other enrollees are all local students but that Syringa is not keeping track of where they are currently enrolled. “We have a lot of great schools in our valley, but it’s great for people to have choice,” Wertich said. 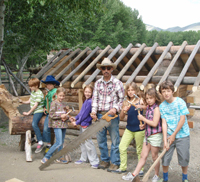 Enrollment forms for Syringa Mountain School are available on the school website at syringamountainschool.org. The enrollment deadline is Feb. 3, 2014. Since the school is state-funded, enrollment is free.